The ntfsprogs package provides a nice set of tools for performing operations on NTFS file systems from non-Windows environments. There are many uses for these, and I’ve found them helpful in virtualized environments when dealing with virtual disk images. In particular, they allow for the easy restoration of individual files from NTFS virtual disks from the host OS. These tools however, are only capable of operating on entire devices, and in many cases the individual partitions of virtual disk images are not exposed as block devices by the operating system, preventing these tools from working. As a workaround for this, I’ve created a patch against ntfsprogs 2.0.0 that adds an --offset option to most of the tools, allowing a partition offset, in bytes from the start of the device, to be specified. ntfsprogs-2.0.0-offset.patch.gz – A patch against the ntfsprogs-2.0.0 source. ntfsprogs-2.0.0-offset.tar.gz – The full ntfsprogs-2.0.0 source with the patch applied. lspart.py – A script that parses the MBR of the device and displays the partitions and their offsets. Once compiled, the tools can be installed with make install, or run in place from the ntfsprogs-2.0.0-offset/ntfsprogs directory without having to install them. The following example demonstrates the tools operating on a snapshot of an NTFS volume stored on a ZFS zvol block device. Failed to startup volume: Invalid argument. Failed to mount '/dev/zvol/dsk/rpool/xvm/win2k8': Invalid argument. The device '/dev/zvol/dsk/rpool/xvm/win2k8' doesn't have a valid NTFS. partition (e.g. /dev/hda, not /dev/hda1)? Or the other way around? ZFS deduplication was recently integrated into build 128 of OpenSolaris, and while others have tested it out with normal file operations, I was curious to see how effective it would be with zvol-backed NTFS volumes. Due to the structure of NTFS I suspected that it would work well, and the results confirmed that. NTFS allocates space in fixed sizes, called clusters. The default cluster size for NTFS volumes under 16 TB is 4K, but this can be explicitly set to different values when the volume is created. For this test I stuck with the default 4K cluster size and matched the zvol block size to the cluster size to maximize the effectiveness of the deduplication. In reality, for this test the zvol block size most likely had a negligible effect, but for normal workloads it could be considerable. The OpenSolaris system was prepared by installing OpenSolaris build 127, installing the COMSTAR iSCSI Target, and then BFU‘ing the system to build 128. After the zvols were created, they were shared with the COMSTAR iSCSI Target and then set up and formated as NTFS from Windows. With only 4 MB of data on the volumes, the dedup ratio shot way up. Though simple, these tests showed that ZFS deduplication performed well, and it conserved disk space within a single NTFS volume and also across multiple volumes in the same ZFS pool. The dedup ratios were even a bit higher than expected which suggests that quite a bit of the NTFS metadata, at least initially, was deduplicated. One of the methods I use for backing up Windows applications is to mirror the files to a ZFS file system using robocopy and then snapshot the file system to preserve its state. I use this primarily for nightly backups and during application maintenance because it typically requires that the service be stopped for the duration of the backup. There are a number of features about ZFS that makes it great for backups. Among them are snapshots, compression, efficient incremental sending of file systems and block storage, etc. Dedup will make its appearance in build 128 which will add further benefits as well. All of these help to conserve disk space and speed up backup and restore operations. This assumes a recent, working OpenSolaris system with the CIFS service already configured. The latest version of OpenSolaris at this time is build 127. For documentation on how to setup the CIFS service, see Getting Started With the Solaris CIFS Service. To start off, create a parent file system for the backups. The purpose of this file system is to allow properties to be set once and then be inherited by the descendant file systems created for the backup sets. Enable both mixed case sensitivity and non-blocking mandatory locks to enhance compatibility between POSIX and Windows file semantics. Set the sharesmb property to share the file system via CIFS and to shorten the names of the shares. The name specified below turns into the backups_ prefix for the descendant file system share names. Without it, the prefix would be the full file system path, in this case, tank_backups_. In addition, allow the backup user access to create snapshots on the descendant file systems so that snapshots can be created by simply creating a directory from the script. With the initial setup completed, begin creating the backup sets. 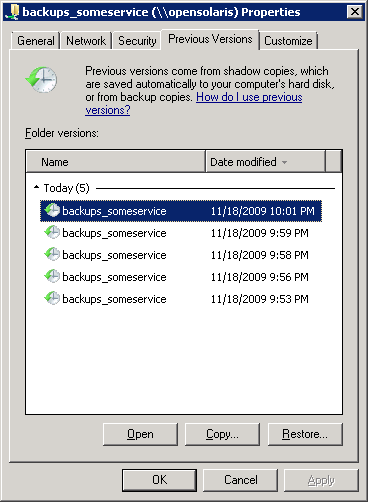 Create a descendant file system under tank/backups for each backup set and give the backup user write access to it. This is a simple example and it might be worthwhile to give other users read access to it as well or add more advanced ACLs to the file systems. Normally, I enable compression for the entire pool and then disable it for file systems that won’t see any benefit from it, such as those holding only multimedia files. If compression isn’t inherited by the backup file systems, it might be beneficial to enable it on them. Those that can spare performance for additional disk space might try gzip compression instead of the default lzjb. Finally, create a customized Windows batch file and set it to run automatically with the Windows Task Scheduler. The script is straight-forward, and the only complicated lines are the timestamp ones. Between the two of them they build a timestamp of the form YYYYMMDD-HHMMSS. The second line fixes single digits that occur, replacing the leading spaces with zeros. The last line is interesting in that instead of simply creating a directory, a ZFS snapshot is taken instead. For restoration, navigate to the share on the server, right-click, select Properties, and then click on the Previous Versions tab. From here, you can easily browse through the snapshots. You can also right-click on individual files and then click on Restore previous version and it will only list the versions of the file that differ rather than displaying every snapshot. There are, or course, a number of ways to improve this backup scheme. Here are a few to test out. /B – Enable the backup privilege, allowing it to backup files it doesn’t normally have permission to. /COPYALL – Copy NTFS security information including file ownership and the data and audit ACLs. Instead of stopping the necessary services, create and mount a volume shadow copy of the NTFS volume and mirror from that location. The flexibility for ZFS is astounding when it comes to backups and it’s amazing what a simple script can accomplish.